All content provided on MamaNibbles blog is for informational purposes only. The owner of this blog makes no representations as to the accuracy or completeness of any information on this site or found by following any link on this site. The owner of MamaNibbles.com will not be liable for any errors or omissions in this information nor for the availability of this information. The owner will not be liable for any losses, injuries, or damages from the display or use of this information. The Rabbids Invasion has begun and just in time for the Easter holiday, you can deliver the Easter Bunny on a more funny note. Those crazy rabbits are not just for Easter and will make great gifts anytime of the year. These funny friends have lept off the screen and into the hearts of children and adults alike and you have a chance to win a Rabbids Invasion Prize Pack below. The Rabbids figures are colorful, sturdy & great for a child who likes to collect cartoon figures. The Invasion Plunger Blaster can go into 'prank mode' which I know my two boys would love. 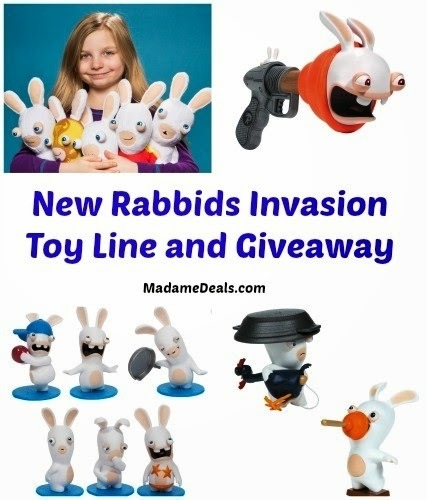 Even more so if you like the Rabbids video games then you will quite enjoy these cute toys too! Every kid's favorite Rabbids are coming off the screen and into your home with the release of the Rabbids Invasion Toy Line. Based on the successful Rabbids video game franchise and Rabbids Invasion, the new 26-episode CG animated television series, which debuted in August and became a hit on Nickelodeon, McFarlane Toys will produce a full product line inspired by the hilarious, impulsive and pop-culture loving Rabbids. The complete Rabbids toy line will include customizable figures, plush and accessories in a variation of sizes and materials, as well as novelty toys with electronic light and sound.